I'm making this comparison because I'm responsible for OSX apps that control Philips Hue bulbs and I hope to shortly have available two apps which will control the new LIFX bulbs.LIFXstyle for Mac is now available. I'm now using both types of bulbs in my home and don't favour one brand or the other, although there are pros and cons on both sides which I hope to list below. The first thing to notice is that the LIFX bulb is physically larger than the Philips bulb. This means trouble fitting certain shades and lamps, but then the Philips bulb is also larger than a regular household bulb (if there is such a thing any more) and I've had trouble fitting those into certain lamps, especially with a screw/bayonet adaptor (more of that later). Once fitted and switched on, the next noticeable thing is the brightness. 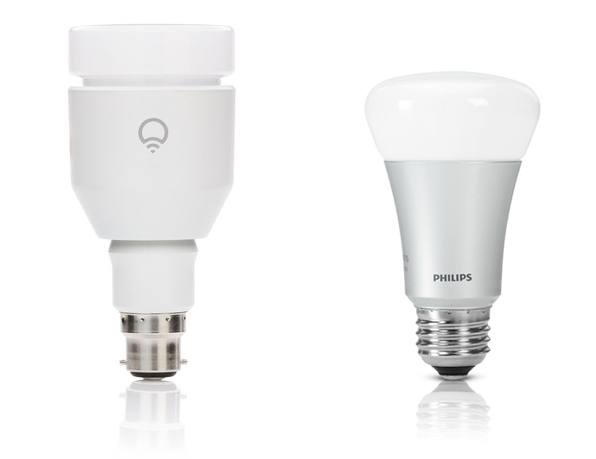 The Hue bulbs go to around 600 lumens, and run up to 9W. The LIFX ones go to 17W and 1000 lumens (these are maximums, the actual power and brightness will of course depend on your colour and brightness settings). Also worth a mention is that the Philips bulbs only come with an edison screw cap (ES). For UK users, this means either buying a fitting which takes screw-in bulbs, or buying an adaptor separately. I found these in a local electrical shop so no problem there but the adaptor does add to the overall height of the bulb. The LIFX bulb is available in bayonet (BC), so more convenient for UK users, as well as screw (ES) and 'downlight'. LIFX bulbs are 'standalone', ie you just buy a bulb, plug it in and your app connects to it. This is interesting after using the Hue bulbs that require a 'bridge' which helps apps talk to the bulbs. The bridge comes as part of a starter kit with three bulbs, after that you buy individual bulbs. It would be wrong to list the Philips bridge as a con though because it does contain some functionality, for example any schedules that you set up sit on the bridge, so even with your computer off or your iPad away from the house, your lights will continue to operate on schedule. In both cases there are a few steps to go through to get the lamps set up and your app controlling them. For me this was trouble-free in both cases and I can't say that one was much easier to get running than the other. If anything, the Philips bridge may make things a little more straightforward - you're only required to press the button on the bridge the first time that you run any app that wants to connect to it. and that's it. But in return for this user-friendliness you have got the extra hardware, extra leads to plug in and another power socket taken. The LIFX bulb may have taken a few more clicks to get running, It involves switching wireless networks and entering your regular wifi key to get everything talking. This was straightforward and just a case of following on-screen instructions. With the bulbs up and running the next big noticeable difference is the colour range. I've seen criticism of the Hue bulbs for the gaps in their colour range. I've developed the app Ambisleeves which changes the colour of bulbs to reflect the album cover of the music currently playing and being displayed by Screensleeves. It's unfortunate that for apps like this, when a primary blue is required, hue bulbs are lacking and a violet-blue is the best they can do. Greens are almost non-existent. I'm not using any kind of measuring equipment, just my eyes, but the difference is obvious. I was very pleased to see the LIFX bulb show a good strong colour all the way around the spectrum. To be fair to Philips, lighting your room with a green light is generally not very conducive to any kind of mood. Price-wise they're in the same ballpark, although with LIFX you can just buy as many or as few bulbs as you like, with Hue you need the bridge, so your first purchase will be the starter kit and you're paying for the bridge as part of that. There are naturally some small differences in the way that they function. One that might be of interest is that if you ever use the wall switch, Hue bulbs will forget their previous setting and come on with a default bright white. LIFX bulbs do remember their colour and brightness settings which is a feature I like. In an emergency, you can override to that by using the wall switch to switch on rapidly after switching off which then gives you a bright white light. If there's anything I've missed, anything you'd like to add or anything you'd like to ask, please use the comments below. [Edit 27 Oct 2014] I've used both types of bulb in my own home for quite a while now and there's one more thing I'd like to note which will be of interest if you'd like to use the false dawn / false dusk feature. The step between 'off' and minimum brightness is quite a step with Hue bulbs, whereas the LIFX bulbs move much more smoothly from minimum brightness to off.